COMPOSITAE. Showy eastern North American perennials with wand-like spikes of flowers in late summer and fall. Some need a short prechill. 'ROCKY MOUNTAIN GAYFEATHER'. Pretty native wildflower with racemes of up to 30 purple 1 1/4" flowers with purplish or rose tipped bracts. Hardy perennial to 3 feet, with narrow leaves. North central U.S. Zone 3. Attracts monarchs. Good cut flower. Good in poor dry soil. Germinates in 1 - 2 weeks. COMPOSITAE. Showy Eurasian hardy perennials grown for their bold foliage and bright summer flowers. Easily grown in moist soil and full sun or part shade. Germinates in about 2 - 3 weeks. Large dark leaved form. Vivid light orange 2 - 5" flowers in spikes, and dark, rhubarb-like leaves. Hardy perennial to 3 feet. Zone 4. Germinates in 2 - 4 weeks. Compact purple-bronze foliage, almost black in spring, and holds color well in summer. Golden flowers on strong stems to 3 feet. Zone 3. LILIACEAE. 'LILY'. Noble flowers, unequalled in their beauty, grace, and magnificence. Native to widely varying conditions, most are easily grown in a light or sandy soil, and only a few species have strict requirements. Most dislike lime, and like good drainage. They do best if mulched heavily in cold climates. Growing lilies from seed is a rewarding undertaking, and are easy if the correct germination method is followed. Most will bloom in 3 - 4 years. Seed viable 2 years; 5 years if kept very dry. Bright orange 3 - 4" flowers with recurved petals spotted brown, with dark orange anthers, in August. Four to 20 blooms per plant. Striking hardy lily to 4 - 8 feet, best in part shade. China. Zone 5. Nice! Root germinates in 5 - 20 weeks warm. Pale yellow 3" flowers spotted brown, with recurved petals. Up to 20 blooms per plant. Striking hardy lily to 3 - 8 feet. China. Zone 5. Best in part shade. Germinates in 3 - 8 weeks or so. Fragrant pale yellow turk's cap type nodding 3 - 5" flowers in summer. Hardy bulb to 2 - 4 feet. NE Turkey. Zone 5 or 6. Root germinates in 4 - 16 weeks warm. 'PINK MARTAGON'. A pink form of the wild turk's cap. Zone 3. Root germinates in 1 - 12 weeks warm. Nice mix of red, orange, pink, and gold. Zone 3. 'NEPAL LILY', Large fragrant nodding trumpet-shaped 6" yellow flowers, blotched rich purple-brown in the throat. To 1 1/2 - 3 feet, the stem running horizontally underground for 1 - 2 feet. Himalayas, to 8500 feet. Zone 5. Germinates in 3 - 6 weeks without pretreatment. The bulbs are edible. 'LEOPORD or PANTHER LILY'. Nodding 4" orange-red flowers with recurved reddish to scarlet tipped petals, and mahogany purple spots on the lower half. To 4 - 10 feet. Rich moist soil and stream banks, California and Oregon. Zone 5. Sun or part shade. Sow April to June outdoors, root germinates in 2 - 9 months, top growth the next spring. 'CORAL LILY'. Fragrant bright scarlet 2" flowers with reflexed petals, in racemes of up to 20, on stems to 1 1/2 feet. Siberia and E. China. Zone 4. Germinates in 2 - 5 weeks. Bulbs edible. "Another beautiful meadow lily, always first of our species to bloom."—Bertrand. Long nodding yellow flowers with recurved petals, up to 20 per plant. Summer-blooming hardy bulb to 5 feet. Caucasus. Zone 4. Sow in spring, root germinates in summer, top growth in fall or the next spring. SCROPHULARICEAE. Easily grown annuals and perennials with snapdragon-like flowers in many colors. Good for cutting. Full sun to part shade, making the best display planted in masses. 'MOROCCAN TOADFLAX'. Bright 1/2" flowers resembling miniature snapdragons, in shades of purple, red, yellow, blue, lavender, pink, salmon, etc., with contrasting throats and long pointed spurs. Blooms abundantly in summer. Compact hardy annual to 8 - 12", with narrow leaves. Morocco. Excellent for bedding and cut flowers. Space 6". Germinates in 1 - 2 weeks warm. 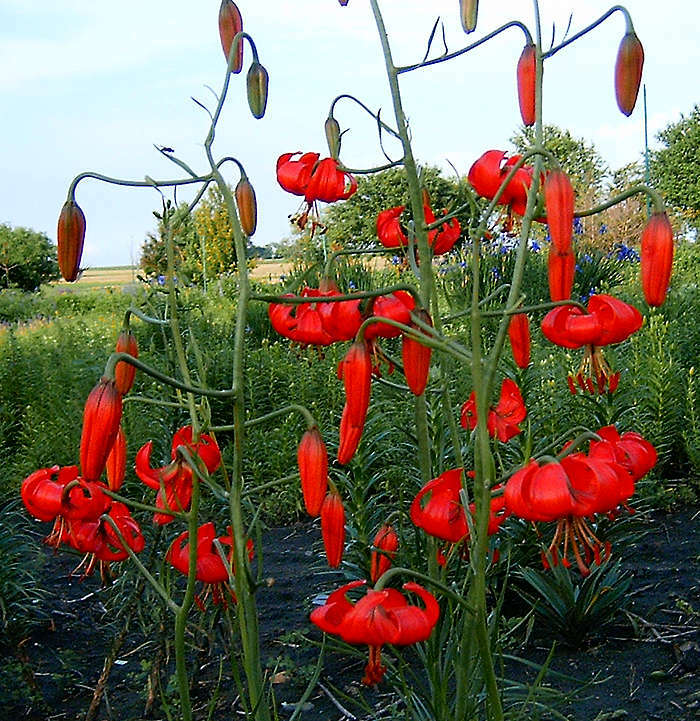 A fine mixture of bright 1/2" flowers in more red shades than 'Fairy Bouquet', and also taller, reaching 2 feet tall. Good for cutting. Germinates in 1 - 2 weeks. Brilliant deep red and yellow bicolored spurred flowers in late spring to summer. Hardy annual to 1 foot or so, with narrow grassy leaves. N. Africa, Portugal. Very free flowering when sown direct. Germinates in a week, best in light. "I love these. I haven't been able to save enough seed... They are like little jewels here and there among the bigger plants. "—Sharon Flower, Maine, 5/2005. 'BRIDEWEED', 'BUTTER and EGGS'. Large yellow 1 1/4" flowers with an orange beard and long spurs. Hardy perennial to 1 - 3 feet, with long, very narrow leaves. Eurasia, N. America. Zone 3. Good in dry sandy soil. The flowers yield a yellow dye. The herb, boiled in milk, was used as a fly poison, attracting and killing them. Medicinal, acting on the liver. Germinates in 1 - 24 weeks. "The junk way to more junk."—W. Burroughs. LINACEAE. Annuals, perennials, and shrubs, with attractive five-petaled flowers in various colors. Easily grown in full sun, the perennials often blooming the first season. Most soils, good to naturalize. All germinate in 1 - 3 weeks unless noted. 'GOLDEN FLAX'. Large bright clear yellow inch wide flowers borne profusely in summer. Hardy perennial to 1 foot. Europe. Zone 4. Germinates in 1 - 8 weeks. 'SCARLET FLAX'. Brilliant scarlet inch-wide flowers with a silky sheen, blooming all summer till frost. Hardy annual to 14", with narrow leaves. N. Africa. Easily grown, producing a nice effect in masses. Self sows but not weedy. Germinates in 1 - 3 weeks. 'PRAIRIE FLAX'. Clear sky blue 1 1/2" flowers. Hardy perennial to 3 feet, with narrow leaves. West America. Similar to L. perenne, but more robust. Seeds were used as food and flavoring by the Indians. "Very pretty."—L.H. Bailey. Germinates in 1 - 3 weeks. VERBENACEAE. Tropical African and American herbs, shrubs, and trees, with small tubular flowers in spikes. Some are popular aromatic herbs. 'YERBA DULCE', 'AZTEC SWEET HERB', 'OROZUZ'. Tiny white flowers in daisy-like 1/2" heads. Small shrub to 1 - 2 feet, with 2" leaves. México. The leaves are intensely sweet when chewed, and are used as seasoning or tea. Roots licorice-flavored. "Much easier to grow than Stevia as it tolerates heat."—Baber. Germinates in 2 - 12 weeks, and light or GA-3 helps. HAMAMELIDACEAE. 'SWEET GUM'. Highly ornamental deciduous trees of N. America and Asia. Valued for their brilliant autumn coloring, timber and aromatic gum. Easy from seed. 'CHINESE LIQUIDAMBAR', 'FORMOSAN GUM'. Attractive 3-lobed 6" leaves are red-tinted in spring and again in fall, downy underneath. Tall tree to 120 feet, with greyish bark. China. Zone 7. Beautiful fall color. Resin and seed-balls used in Chinese medicine. Silkworms that feed on it produce superior silk. Spirits are believed to inhabit the top of the tree. Germinates in 2 - 4 weeks. 'SWEET GUM'. Large, star-shaped 5 - 7 lobed 7" leaves turn brilliant crimson in fall. Tall tree to 50 - 150 feet. Inch wide spiky fruit balls. Connecticut to Nicaragua. Valued street and shade tree. Germinates readily in 2 - 4 weeks, stragglers up to 10 weeks. The sweet aromatic gum is chewed and used medicinally. Produces a fine wood and the seeds are eaten by birds. "Unsurpassed in the brilliancy of autumnal colors..."—Sargent. Zone 5. SAXIFRAGACEAE. Dainty North American perennials. 'WOODLAND STAR'. Starry white flowers in dusters on a bog stem above the rosette of divided leaves. Hardy perennial to 20". W. N. America. Zone 5. Surface sow to germinate in 3- 20 weeks.